While most investors are focused on Italian politics - the parallel currency 'mini-BoT' fears and potential for a constitutional crisis - Spain is now facing its own political crisis amid calls for a no-confidence vote against Rajoy. 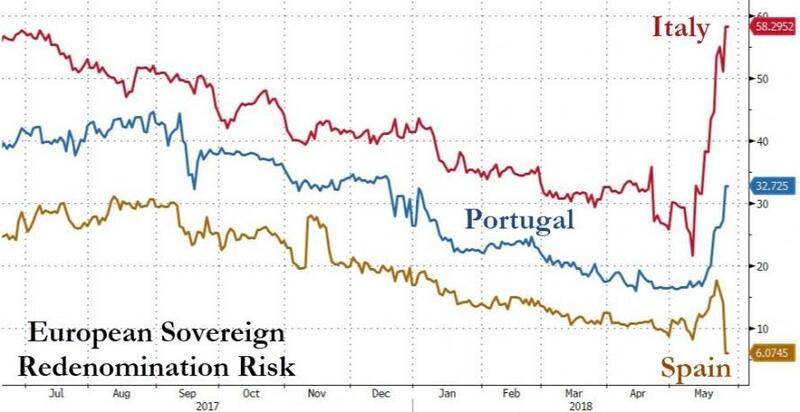 However, 'Spaxit' remains a distant concern for investors as another member of the PIIGS peripheral problems is starting to signal concerns about 'Portugone'? As Statista's Brigitte van de Pas notes, on average, European Union countries had a gross government debt of roughly 81 percent of GDP in 2018. This average disguises real differences between EU countries. Whereas Greece had a government debt of 177.8 percent in 2018, Estonia had a debt of only 8.8 percent - the lowest in the entire EU zone.